Onion rings with Boone's 57 sauce (front) and The Q Platter with double pork, beef brisket and St. Louis ribs. Queen City Q is a fairly recent addition to the Charlotte BBQ scene. Located close to the 7th St. light rail stop, it's a perfect place to ride & dine. A few weeks ago Calvin and I walked uptown from our house, participated in a twilight 5K race and had a great dinner here before taking the train back home. If you don't live close enough to walk or take the train, parking is validated in the adjacent deck. In addition to a huge indoor dining room and full bar, there is a nice patio where we sat. 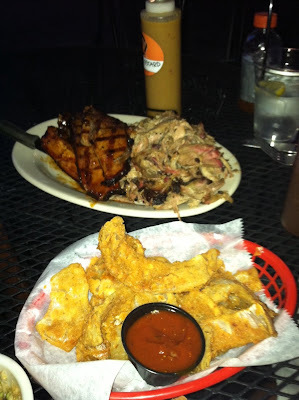 We decided to share an order of the onion rings appetizer and The Q Platter - you could choose up to 4 meats but since we love BBQ pulled pork we doubled up on that and had the brisket and the ribs as well. All of the meats were smoky, succulent and tasty, particularly the St. Louis ribs. It was also a portion big enough for a third person! Queen City Q has a wide variety of sides including all of the usual suspects plus a few innovative additions like corn & edamame salad. Our chosen sides, mac & cheese and BBQ slaw, were good choices but I'd like to return to try the greens and sweet potato fries. Salads and tacos, two types of chili and Brunswick stew are also offered. I also like that they include Texas toast with the entrees - yum! I look forward to dining here again and trying more menu items! Eastern NC BBQ slaw and mac & cheese. Chicken tikka masala (left) and saag (spinach) paneer. After hearing about Madras Chettinaad for years from my former yoga instructor in Atlanta, two of us from the office went with Elizabeth, our fabulous yogini, for dinner just before I moved to Charlotte. After the hour plus drive I was ravenous and luckily, Madras Chettinaad came through in a big way. We started with samosas, which I always love - but here they were truly outstanding, flaky, not at all greasy and filled with spiced potato goodness. I adore the tamarind and mint sauces served on the side - so delicious! For the main course we shared a special dosa, chicken tikka masala and saag paneer along with an order of garlic naan. I really like how Madras Chettinaad serves great veggie and meat dishes. Their focus is on Chettinaad cuisine, which originates from a region of the Tamil Nadu state in India. This means there are tons of great vegetarian curries and dosas as well as meat dishes, all perfectly spiced. Everything we tried was fantastic, with good flavor, but not so spicy that the taste was overpowered. The chicken tikka masala was a particularly tasty rendition. I'm told that the weekend buffet here is something to behold. Although I'm not likely to be in Alpharetta again anytime soon since our move to NC, it is definitely worth an extra special trek to try this place. Thank you Elizabeth for introducing me to this great Indian restaurant! Samosas - perfectly fried with very little grease. Special Dosa with chutneys and dipping sauce. Garlic Naan. Buttery, garlicky and delicious! Rack of New Zealand Lamb. Our family has dined at Glen-Ella Springs several times over the years since we have a relative who lives nearby. There are few choices for a high end meal in this area of Georgia and Glen-Ella's location gives it a special charm. Located in Clarkesville, Georgia in the north Georgia hills, Glen-Ella is a bed & breakfast in addition to offering dinner to the public. The historic property boasts more than 12 acres, a swimming pool, a fire pit, an herb/flower garden and wonderful views. I have never stayed at Glen-Ella but from what I have observed it would make for a very refreshing weekend, with the option of hiking nearby or relaxing and playing games on site. Most recently I dined at Glen-Ella for dinner in April 2012. Unfortunately, the food seemed to have taken a downward turn as compared to my previous visits - we heard that they have gone through several chefs in recent years which might explain the drop-off. First the highlights - the crab cakes and spinach salad were both good. If I find myself dining here again I might ask to have the crab cakes on the spinach salad or order one as appetizer and one as main dish. The trout, previously a favorite of my grandmother's was practically inedible. Poor grandma pushed it around on her plate but was not able to enjoy it. The lamb chops and ribeye were passable but really nothing special and the vegetarian wellington tasted quite odd - kind of a mess of cheese and doughy pastry, not at all what I expected. The ravioli special was also fine but nothing memorable. Service was mostly good but seemed a bit amateurish for the level of restaurant it appears the owners are going for; still, anyone who can handle a large group (we had 6) should be commended for getting mostly everything right. I was really excited about going to Glen-Ella this last time but unfortunately it did not live up to years past for me. Still, with such a beautiful view and location, it is a worthy destination especially if you can stay overnight. Perhaps they will change chefs again in the near future - hopefully this time it will be for the better and we can return for a nostalgic dinner that lives up to our earlier visits. Molten Chocolate Cake - a sweet end to the meal - who can resist warm chocolate cake? The Farmer's Market Frittata with fruit. On Easter Sunday my mom treated us to an Anniversary brunch at Harvest Moon Grille in Charlotte. Attached to the Dunhill Hotel uptown Charlotte, Harvest Moon Grill is a farm to table operation that opened following the success of a food cart with the same name - their motto is "Farm to Fork". Harvest Moon offers 3 squares a day and weekend brunch. We were lucky enough to snag an outdoor table which allowed for us to enjoy the beautiful day and the people-watching. I enjoyed brunch but the food did not stand out in the way I expected after reading about this place in advance. The flavor combinations worked but lacked something of a punch for me. The omelet and frittata were fairly standard to me and a bit overcooked. However, the house-cured bacon was delicious and went great with the pancakes. I do look forward to trying lunch and dinner here also as the menus look very tempting. I appreciate what they are trying to do at Harvest Moon and these days many people are drawn to restaurants that emphasize local produce, meats and dairy products. Hopefully I will get to try more soon! Cooking classes are also offered and the restaurant's website contains a lot of information about he local farms and events in addition to the menus and other standard information. Buttermilk pancakes and a side of bacon. Shrimp and oyster platter with fries. Is this some fried goodness or what?! With multiple trips back and forth from Charlotte to Atlanta we are always looking for a good place to take a break and have a meal. One evening Calvin wondered if there might be a good fish camp along the way and behold, after some iPhone research we came upon Elliott's, which is a real find! Tucked away just off I-85 in Fair Play, SC near the GA border, is Elliott's Fish Camp. The oysters we had were incredible and we enjoyed everything we had including the delicious hush puppies brought to each table and the onion rings. Pitchers of sweet tea rest on the tables ready for your enjoyment and there is even a small salad bar. You do need to be aware that Elliott's is cash only but luckily a full seafood meal won't set you back too much. You should come out for around $30 (or less) for two. As we continue to make the back and forth trek I look forward to supporting Elliott's for years to come! Elliott's is only open Thursday through Sunday and their hours are limited so call ahead to verify hours. This place is family owned and operated and their seafood is the REAL DEAL. Fried flounder with onion rings. Hush puppies, salad and slaw (photo didn't come out so well!) from the salad bar. While I was still in Atlanta I was invited to a special tasting at R Rice in Dunwoody. This pan-Asian restaurant's byline: "wok, grill and sushi" understates how huge its menu is - and there truly is something for everyone! The menu contains a variety of traditional and innovative sushi combinations, Japanese, Chinese, and Thai cuisines and even tacos. The location off Hammond Dr. is easy to miss although it's near the corner of Peachtree Dunwoody and Hammond and there is ample parking once you find the right lot. My overall favorite dishes include the massaman curry (above): a huge portion with good spice and flavor; and the salt and pepper soft shell crab. Get the crab over the calamari - it's something different and it's better. The special sushi rolls we tried were also tasty. R Rice uses some unique sushi wrappers including soybean paper and cucumber, although I love the traditional seaweed wrappers personally. Several in our party tried the cocktails, which came in an array of rainbow colors and were determined to be on sweet end of the spectrum - good for those who enjoy fruity drinks. The fried green tea ice cream was a nice end to the meal - I'm a sucker for green tea ice cream so I knew this would not be a bad choice! If you are in the area, you should give R Rice a try - you will definitely find something you enjoy! Salt and pepper soft shell crab. The King and Queens' Crown - king crab with house seasoning and crunchies wrapped in avocado. Fried green tea ice cream - deliciously sinful! Bar, dining and kitchen areas in the open restaurant. Just before leaving Atlanta I had met up with fellow food blogger Malika of Atlanta Restaurant Blog at Cardamom Hill for dinner. The location of this new Indian restaurant which focuses on owner Asha Gomez's native Kerala region is convenient, right off I-75 on Howell Mill and once you are inside it is easy to forget you are in a nondescript strip-mall. Cardamom Hill offers set lunch menus, which change daily and has a full a la carte dinner menu as well. A small bar welcomes patrons near the front of the restaurant. Service was prompt - in some ways a little too rushed; it was clear the server was ready for us to move along so that he could have another table. This irked me for a place that is so expensive. Nevertheless I found the food interesting and for the most part delicious. Still, several improvements could be made. The shrimp molee appetizer and the entree vegetable plate were my favorite items that we tried. However, it was difficult to know how to eat the shrimp molee dish - it begged for more appams (steamed rice cakes) or rice for the delicious sauce. The duck and plantain croquettes came in a tiny portion and were ho-hum except for the one piece of dried fig, disappointing after hearing a lot about them. As mentioned the vegetable plate was truly outstanding, with flavors that complemented each other in a satisfying way. The spicy fish curry was spicy, which I like, but the flavor was almost lost in the spiciness and again the portion was quite small for the charge. In my opinion Cardamom Hill needs to work on appetizers fit for sharing and should be a bit more generous with portions; alternatively they could lower their prices. Vegetable Plate - my favorite thing - lots of great flavors. Spicy fish curry, quite spicy and a bit oily. Carolina Pork Plate with fries and slaw. All plates come with hush puppies and pickled onions. Midwood Smokehouse is a welcome addition to the Charlotte BBQ scene. Located in the ever burgeoning Plaza-Midwood neighborhood, Midwood delivers on the 'Q while at the same time adding modern flair with dishes like smoked vegetable bruschetta, smoked turkey and sausage and a Cuban sandwich. The pork BBQ was smoky and delicious and I love that they have 4 sauce options to choose from. 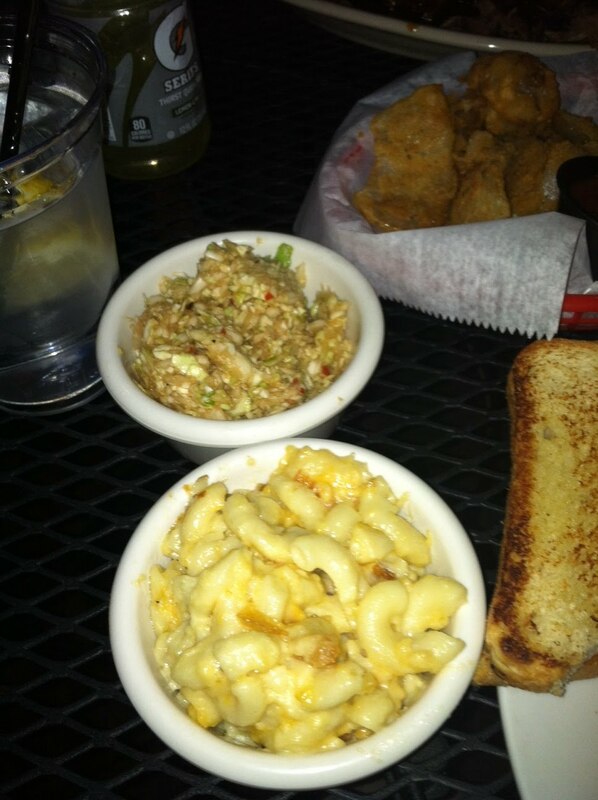 The mac & cheese was a standout side and the hush puppies were tasty too. I look forward to going back to try the ribs, the pimento cheese fries and the desserts. Smokehouse Bruschetta made with goat cheese. Midwood offers decktop, patio and indoor seating and has a full bar. Special of the day: Fried smoked wings - you can get the smoked wings anytime and on the side, bacon wrapped jalepenos, available as an appetizer or side. Sauces: Mustard, NC Vinegar, Midwood Signature and Spicy. I liked combining the vinegar sauce with the spicy sauce - yum! Smoked half chicken Midwood Style with BBQ baked beans and mac & cheese.